"Insulin shots and hairball medicine? Gimme a break!" When Winston was diagnosed with diabetes you had to start watching his diet to help control his weight and blood sugar. Just to make things interesting, though, your big baby recently started coughing up hairballs. So now the trick is to control his diabetes and hairballs at the same time. The good news is that the over the counter hairball remedies that you can get from the vet are safe to give to your diabetic cat. The issue is to control his carbohydrate intake. Vet tech Kendra Shephard says over the counter hairball remedies won't affect Winston's blood sugar because you don't give him a daily dose and the small amount won't significantly increase the amount of carbs or sugar in his system. Petroleum jelly is a standard go-to hairball remedy, and a safe one for your diabetic cat. Like the over-the-counter hairball medications, the amount you need to use is so minuscule it won't impact his caloric intake or his blood sugar levels. One-quarter of a teaspoon is all that's needed, according to "The Doctors Book of Home Remedies for Dogs and Cats." A trick you can employ if your kitty doesn't take kindly to the unpleasant oily smell is to smear it onto his paw. Your fastidious feline will lick it off, swallowing the remedy in the process. A fiber supplement will help Winston pass hair through his system so he won't hack it up on your carpet. Your vet or the pet supply store carries psyllium fiber in bulk or pre-measured in capsules. You also can try to give your cat a dab of plain, canned pumpkin. Pumpkin contains the fiber he needs and most cats actually like the taste. Don't overdo it when dispensing the pumpkin, though. Anything more than one-half tablespoon isn't necessary, and too much could introduce too many carbs into his system as well as loosen his bowels more than either of you would like. Specially formulated food for cats who suffer from a chronic hairball problem are available, but they aren't the best choice for your diabetic cat. Ones that come in dry kibble form contain high levels of carbs, a necessary addition to make the dry, hard food. The 2008 book "Cat Owner's Home Veterinary Handbook" says that some vets advise clients to add meat to their diabetic cats' diets and avoid the kibble altogether. Ultimately, consulting your vet on the specialty food issue is your best bet. You should consult an experienced veterinarian regarding the health and treatment of your cat. Cat Owner's Home Veterinary Handbook; Debra M. Eldredge, DVM, et al. 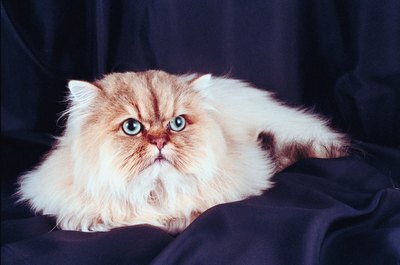 Do All Cats With Hair Get Hairballs?